Manchester has a proud record of widening participation in higher education. Our students are playing a big role in reaching out to the next generation. Letitia Budu, Social Anthropology undergraduate, is an enthusiastic advocate for The University of Manchester’s outreach work. As part of a Summer Experience Internship with the Widening Participation Team she worked on the Manchester Access Programme (MAP), which supports talented students from under-represented backgrounds to enter higher education. Since it started in 2005, more than 1,800 MAP students have successfully gained a place to study at Manchester. Letitia received the University’s Manchester Bursary, as well as a work experience bursary that covered her living costs during her internship. The Careers Service, based in the University’s Directorate for the Student Experience, gives priority to Manchester Bursary students when allocating Summer Experience Internships, a scheme that offers pre-final year undergraduates the opportunity to undertake an internship either within the University, or in a charity/not-for-profit organisation. “Graduates are disadvantaged if they don’t have work experience,” she says. “But some students can’t afford to stay here over summer and can’t get suitable experience at home. I was so happy to get the bursary. Manchester has one of the largest cohorts of students in the Russell Group from low-income households; more than one-third of our students received a bursary in 2016/17. Additionally, students at Manchester who have participated in MAP or have spent time in care also receive the Undergraduate Access Scholarship, funded by donors. Professor James Thompson, Vice-President for Social Responsibility, is clear about the value of opening university up to a wider community. “Due to all sorts of barriers, the brightest and most able students don’t always get the opportunities,” he explains. “Widening participation helps us recruit those students, and we and society are better for it. We want as diverse a community as possible, because having students from different backgrounds influences what we do here. PhD student Nicola Runciman agrees. 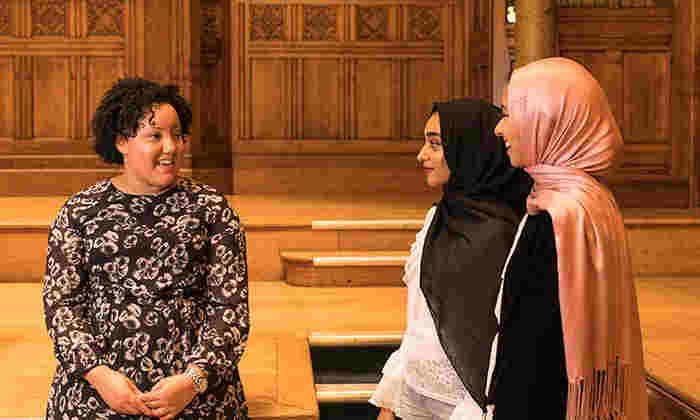 She’s worked as both a MAP tutor and with the Brilliant Club, a charity that works to encourage pupils from under-represented backgrounds to apply to selective universities. “It’s a great way to get more experience – of teaching, meeting the local community, giving back and gaining new skills,” Nicola says. “Explaining my PhD work to schoolchildren also helped me to reflect on the value of my own education – its purpose and context within academia and society. “I’d love a job in widening participation,” she concludes, laughing. One of Manchester’s change-makers of the future, perhaps?